Holly Grey only joined the women's group to keep her friend out of trouble – and now she’s knee-deep in hassle, in the form of apocalyptic weather, armed men, midwifery... and a sarcastic Welsh journalist. Holly doesn't believe in magic, but her best friend is determined to drag her along to this new coven she's heard about. It was founded by a woman who seems convinced that checking out a couple of books on witchcraft from the library and following the instructions will allow them to cast spells and obtain their hearts' desires. Suddenly, Holly is spending too much time wandering around the cold woods, making disgusting concoctions. She's also distracted by Kai, a mysterious Welsh journalist she's met through her brother, who seems to be playing games with her. 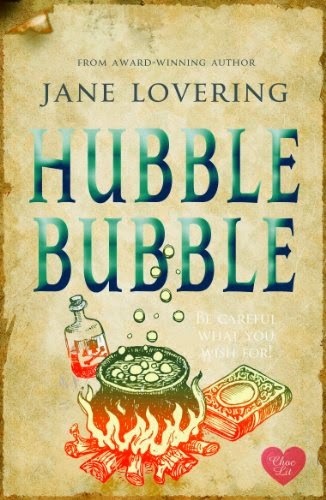 My main problem with Hubble Bubble was that the author's voice didn't appeal to me. It felt like Lovering was trying too hard to be zany and hilarious, but instead, it made pretty much all the characters (including Holly, the narrator) sound like they couldn't stop blabbing and were not very intelligent. Kai was the exception, since he's meant to be mysterious (witness the short, cryptic chapters written from his POV as if he was talking to someone, or writing in a diary), but even that didn't quite work, as he came across as melodramatic instead. Reading all this kind of exhausted me, so I gave up at about the halfway point. A shame, because there were elements that I was quite intrigued by. I was tickled by the idea of someone doing magic almost by mistake, casting a spell they thought was just pretend, and then having to face the consequences (at least, that's where I assume this was going). Since Holly thought the whole spell thing was rubbish, she made her wishes in a sort of jokey way, so I imagine they would have been fulfilled in unexpected ways. I was also interested in Holly's relationship with her brother. He's got mental health issues, and Holly functions as a sort of carer to him. They don't live together, but Holly frequently goes to his house and sorts all kinds of things out for him, from washing to doing his shopping for him and of course, making sure he's functioning. What I was interested in was her very matter-of-fact attitude towards this. It's just what she does. She would love her brother to be better, but she seems quite content to be doing this for him. I did want to see how that would develop, especially in the context of Holly's wishes during the spell-casting, but not enough to keep reading. HUBBLE BUBBLE is in my TBR pile, but I did read PLEASE DON'T STOP THE MUSIC, which I really liked. It surprised me, in fact, because I had no idea what to expect. Sometimes voices work for us, sometimes not, and there's just no way to know. Absolutely, reviews can only go so far. There are quite a few authors whose stories sound amazing and I really, really want to read, but the voices just don't work for me at all. Kindle samples have been very helpful, but even those don't work all the time.